You might already know how this story goes: the Cadillac Escala concept is nice, but we think it would look even better as a two-door convertible and traditional four-door sedan. But you know what’s selling faster than Buicks in China? Crossovers. So, we’ve dreamed up this Cadillac Escala crossover/SUV. To us, the vehicle in the rendering would make the best-looking full-size CUV on the market blush: it has the dimensions, the stance, the presence and the elegance to stand up to the likes of the Mercedes-Benz GLS/GL, which currently has the full-size luxury segment nearly all to itself. On our imagined Escala crossover, a long hood hints at our imagined Escala SUV’s rear-drive Omega platform — the same lightweight, nimble, and perfectly-balanced architecture that underpins the Cadillac CT6. Meanwhile, the elegantly aggressive front end makes a statement without saying a single word. The side character lines, along with the slightly sloping roofline, make for a unique profile. Both are complemented by large wheels filling in even larger wheel wells. The rear end features an elegant hatch that integrates the taillamp design originally introduced on the Escala. There’s also a metal skid plate that integrates dual-tip exhaust outlets on each side of the vehicle. In all, this design exercise proves that the Escala design language works extremely well on other vehicle types, perhaps even better than on the original liftback Escala concept. Cadillac’s single biggest limitation today is a lack of a strong crossover lineup, as the XT5 is the brand’s only CUV, while German rivals such as BMW, Mercedes-Benz, and Audi each have at least three, with more on the horizon. In its defense, Cadillac will expand its crossover portfolio over the next several years, we can picture a full-size prestige-luxury CUV like this one sitting at the top of the Cadillac crossover hierarchy, where it would compete with the likes of the segment-defining Mercedes-Benz GLS-Class (née GL-Class), Land Rover Range Rover, along with the upcoming BMW X7, Audi Q9, and a new full-size crossover from Lexus whose name is currently unknown. Here’s to hoping something like this will come to production as a Cadillac XT7 or XT8. looks better than the liftback four door coupe…..Cadillac needs to put it’s special focas on CUVs…..in fact a CUV would make more sense as a flagship…..a four door coupe will have limited rear head room and cargo space. I think you could add to the list the Volvo XC90 , Porsche and Bentley CUV’s as well . The later two are new to this market . Here in the States you will never hear the word station wagon , that would kill the vehicle at the start . The design of CUV’s has to start coming up with a design like your rendering that could actually be a tall car with a hatch back . It’s got to the point that almost all mid-size CUV’s look alike and by that I mean the major shape of them . That is one reason I hate to see the current Terrain’s body being replaced because the design of the body is so much different than many in its segment . It will be interesting to see what Cadillac new body styles will look like . Well, the XC90, Porsche Cayenne, and Bentley Bentayga (along with their cousin, the Audi Q7) are more along the lines of large midsizers, rather than full-sizers like the MBZ GLS-Class and what I suspect will be the X7 and Q9. That said, the styling will be interesting to see. The design language of the Escala concept works really well for crossovers, which might give us a hint about the design of its upcoming CUVs. You think so? I think a mini-Escalade look would work better. I hate to say it, but the Escala’s design language doesn’t have that balance of elegant and badass the Escalade has. Yes sir – Porsche isn’t ‘late to this market’. They launched the Cayenne in 2003 (? 2004 model year). And then had the Macan in the works, which they can’t keep up with sales. They all come in a 6, 8 and Turbo, so – much to the dismay of purists at the time – they were way ahead of the CUV/SUV curve. Same for BMW – X5, X3, and the ok-ish X1. Ahead of the curve, though. And Audi. The Escada CUV looks pretty good, though. Seems like a smaller Escalade option would do well, too. (Keeping the big one in the fold). 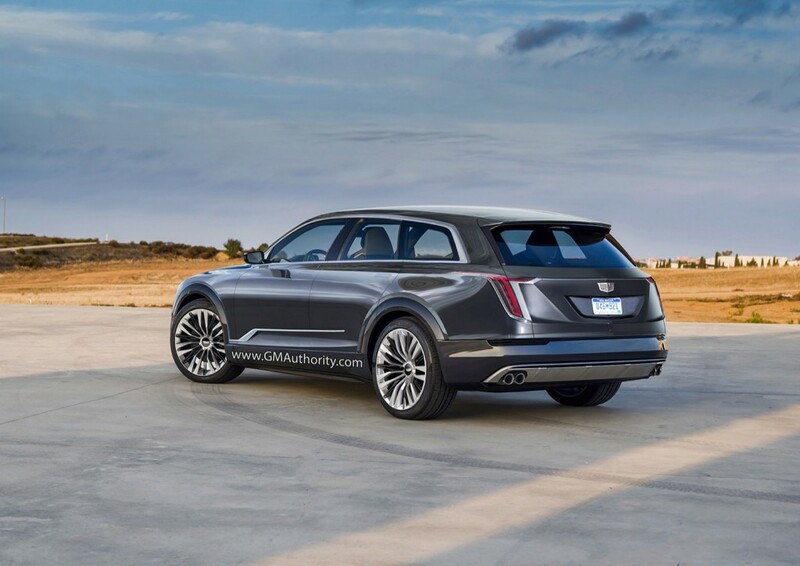 the XT5 looks like a turd compared to this rendering….however I’m not liking the sloped rear roof and the raised rear beltline and the rears look fatter than the fronts on Caddys these days. It looks like a slightly nicer Lincoln MKT and we know how great that thing sells lol. Not digging this at all. Of course I don’t dig crossovers period so no matter how glamourus it is ,,I will hate it. But I give your artist credit for attempting to make homly crossovers look even one bit cool. For the sake of Cadillac enthusiast everywhere, lets hope they keep the flagship a sedan/Coupe or worst case situation, a Escala type car. Looks beautiful. That would be a huge hit. Too bad the actual XT7 will be a FWD Lamba-based rebody of a Chevy Traverse with all the frumpiness of the other FWD kid-hauler, the XT5. I know this is what the market wants but it’s really hard for me to see Cadillac as a changed brand when so much of their lineup continues to be derived in large measure from GM’s mass market offerings. I think the Convertible is my favorite looking, but this is the one I would buy. Not bad looking! Really liking the aggressive stance from the rear quarter panel! However, if the real XT6/7/8 is to be FWD and given FWD-based proportions, then I don’t expect the design to be nowhere near this appealing! There seems to be no strong indications pointing to the much needed Omega-based CUV to grace Cadillac’s showrooms, and I highly doubt Cadillac will use the Colorado/Canyon platform to under the potential Trailblazer/Envoy SUV’s to come. So we might as well expect the next big Cadillac SUV to ride atop either an elongated XT5/Acadia platform or whatever the next Enclave will be built on….As long as they build a Cadillac around it. and not a nice Chevy with lots of wood, leather and LED’s, I’m looking forward to it! Wow ! Yeaaaah ! This look’s awesome ! Go 4 it !! ya it beats the current design theme. Looks very cool, do an Escalade one next! This should be called the XT7 Escalade. Raise the roof and call it the XT8 Escalade (a la RR v RR Sport). This should replace the current Escalade. Lengthen the wheelbase of the XT8 and call it the XT9 Escalade. Replaces ESV. Create a 2-row version (XT6 Escalade) to compete with the likes of the Range Rover Sport, the X5 and the Cayenne. This one should have a 600+ hp V variant. All of these must be built on the Omega platform, all with the 10-speed automatic and AWD. Use the 3.0TT as the base engine (350-hp and 400-hp versions for the XT6 and XT7, 400-hp only for the others) and the 4.2TT as the optional engine. Hybrid and diesel options are welcome too. Meh, this blends in with the pack too much for me, especially with the de-emphasis and diluting of the vertical lighting elements. Curtnik nailed it – there is an absolute lack of badass-ness in this design. That’s better than any Cadillac crossover on the market in my opinion. GM should put you guys in charge of their design studios.